Paint For Pro’s SketchPaint: for the best result! 1.What’s Paint For Pro’s SketchPaint? Paint For Pro’s SketchPaint is a one-component paint. Easy to apply in any business environment (office, school and in healthcare and hospitals). Due to its unique composition Paint For Pro’s SketchPaint makes the surface much smoother than other whiteboard paints after hardening. Much better to write on and easier to clean. The paint can be easily sprayed or applied with a short-haired fleece roller and can be written on after 24 hours of drying. 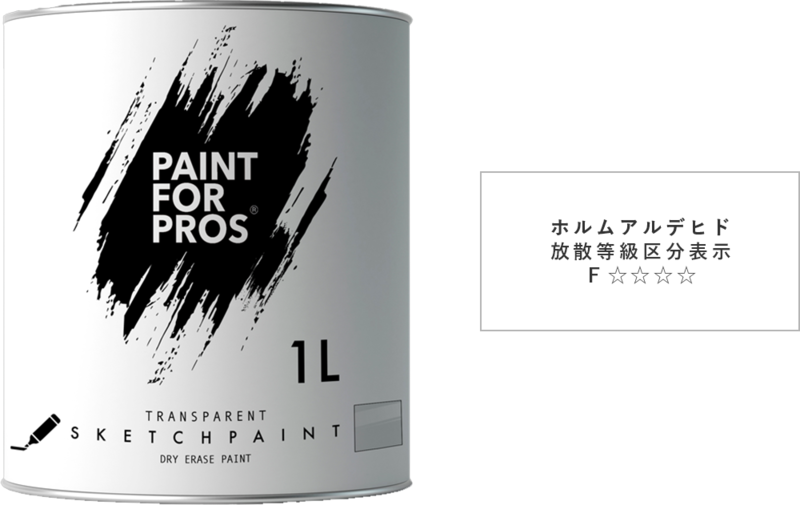 Paint For Pro’s SketchPaint is transparent, so suitable for both coloured and white surfaces. Use Paint For Pro’s SketchPaint straight out of the container. After use, the container can easily be closed again, so you can use the rest of the paint at a later time. Paint For Pro’s SketchPaint is ideally suited for a professional environment through its hard and remarkably smooth top layer: easy to write on and easy to keep clean. If quality of the final result counts, then Paint For Pro’s SketchPaint is the solution. With Paint For Pro’s SketchPaint the traditional whiteboard is now really unnecessary. You can now integrate the whiteboard stylishly into any interior with this amazing paint. No more loose whiteboards that get in the way in the office, but a whiteboard painted on (a part of) the wall in any shape you want. Plus it does not matter if it is a concrete, wooden or painted wall; the original appearance is simply maintained. And it is always around when you need it. Unique to Paint For Pro’s SketchPaint is the composition that ensures a really super smooth surface. As stated, not only particularly good to write on, but also quickly and easily cleaned. Even if the surface has not been cleaned for some time, you can remove the remains of whiteboard markers and colour casts after intensive and prolonged use easily. Paint For Pro’s SketchPaint is easy to apply and ready for intensive use!